A trough has runs along from the Karnataka coast and tilting slightly West, towards the Kerala Coast. An UAC has embedded itself in the trough around the Lakshdweep Islands. This could descend to form a Low off the Kerala coast by 14th May...Low will persist in a trough off the South West Coast off India. Expected to strengthen and track NW...will update on Thursday 14th again. Heavy rains likely in Kerala on 14th Thursday and 15th Friday. The hilly interior regions in Kerala may see some very heavy showers on 14th Thursday and 15th Friday. Almost all of Maharshtra State may get thunder showers on 14thThursday. Heavy Thunder Shower expected in Mahableshwar on Thursday..
A UAC at 850 hpa will form in the South Central Bay on the 15th...A trough may embed a Low in the South Eastern Bay around 17th May. Mumbai: 13th Wednesday and 14th Thursday: Hot sultry day, with humid and sweaty conditions at 35c and 27c at night. Partly cloudy, getting cloudy with thundery developments in the East by evening. Showers expected in Eastern Outer townships on Wednesday and Thursday. Friday 15th: Hot, sweaty and cloudy. At 36c, its going to bring showers in the daytime on Friday. Evening thundery showers. Pune: 13th Wednesday and 14th Thursday will be cloudy with thunder showers in the late afternoon and evening. heavy showers in parts on Wednesday night. Friday 15th will be cloudy, and cooler with day's high at 30c. Light rains in the day, getting medium to heavy in many parts by evening. Goa: 13th Wednesday/ 14th Thursday and 15th Friday: Cloudy with showers evenly spaced out in the afternoon and evening. Some stray showers on Thursday morning. Rainfall increases from Saturday. Bangalore gets the local thunder shower on 13th Wednesday. Thursday's 14th thunder shower will be heavy in many parts, cooling the city. Hyderabad: Next 3 days, partly cloudy, with day temperatures within 38c...city can expect a light thunder shower on Thursday evening. Aurangabad: Light showers on Wednesday and Thursday evenings, and a thunder shower on 15th Friday. Days dropping from 40c on Tuesday to 33c on Friday. Next Update of Weekend Forecast on Thursday 14th.. The cyclonic circulation over Comorin area and neighbourhood now lies over Lakshadweep area & neighbourhood and extends upto 5.8 kms a.s.l. Almost all stations in Kerala reported rainfall. Hence, cut-off is kept at 40 mm. The cyclonic circulation over Comorin area and neighbourhood now lies over Lakshadweep area & neighbourhood and extends upto 5.8 kms a.s.l. Over 300 stations have reported rainfall above 10 mm. Hence, cut-off is kept at 40 mm. A trough upto 1.5 kms a.s.l. extends from Sub-Himalayan West Bengal & Sikkim to Odisha across Bihar and Jharkhand. The cyclonic circulation over southwest Bay of Bengal and adjoining Sri Lanka now lies over Comorin area and neighbourhood and extends upto 4.5 kms a.s.l. A trough extends from the cyclonic circulation to south interior Karnataka in the lower levels. Dattaraj: On gong thunder activity is normal for the peninsula..please refer to the MW-1 and MW-2. It will help bring in moisture inland. Is there any possibility of early onset of monsoon over west coast and mumbai owing to formation of low in Arabian sea. It seems more n more likely that pre monsoon low in Arabian sea will initially move north west but then tilt east towards Gujarat coast. That could bring heavy rains in Gujarat n Mumbai coast by 23th May. I know its Too early, need to keep eyes on it. It seems low will form in SWBOB? Saeed Monsoon will be on schedule as given in Monsoon Watch...if chnges take place will inform . 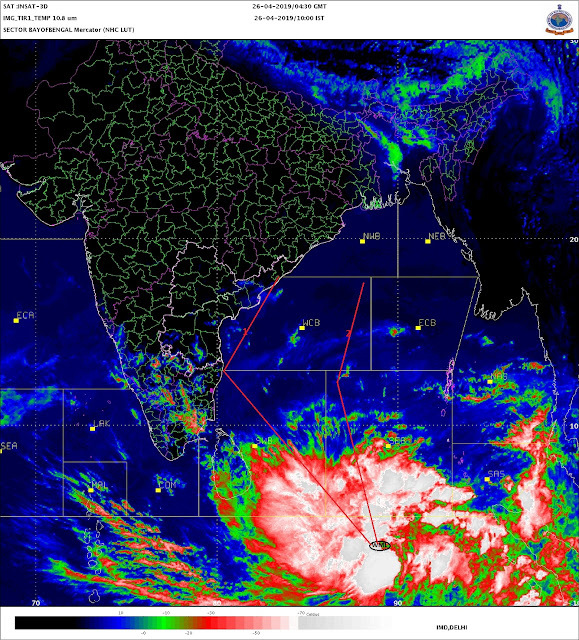 Low pressure in Arabian Sea will strengthen ...maybe and travel NW as mentioned. Now it seems low will move west wards and then fizzle out in the sea.